They say that whole cereals should also be used nowadays in everyone’s daily diet. Piero Peduzzi, father of the current owners of the company, already pioneered this idea back in 1981: he decided to introduce in the market a line of bronze drawn whole wheat pasta, in a period when such speciality was not even regulated yet. 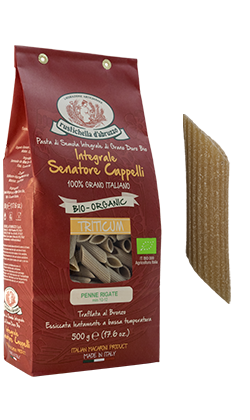 Rustichella d’Abruzzo, in the same forward-looking way, decided to produce exclusively organic whole wheat pasta, taking into account that it is on the outermost part of the grain that most of the synthetic substances used in conventional agriculture are. The organic whole wheat product has undeniable benefits for the health, besides being top quality. Our ‘Senatore Cappelli’ whole wheat semolina is obtained from the complete grain with its bran and germ, the noblest part. In 1824, Antonio Viviani published the fun poem “Li maccaroni di Napoli”, where the word “Spaghetto” first appeared, as pasta was synonym of “maccheroni” until the 18th century. It originally was 50 cm long, then it has been cut and shortened over the years until reaching 25 cm of length. 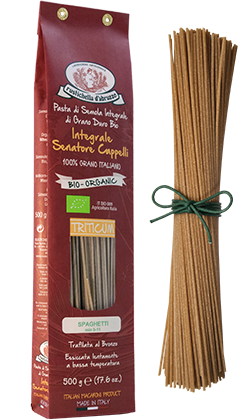 Rustichella d’Abruzzo “Senatore Cappelli” durum whole wheat Spaghetti has the unique rusticity and intense perfume of the wheat and are extremely versatile. Try it with seafood-based condiments, such as shelled scampi, crispy leek and Rustichella organic Extra Virgin Olive Oil, or with Rustichella d’Abruzzo organic ‘Pesto alla Genovese’. Cooking time: 9-11 minutes. 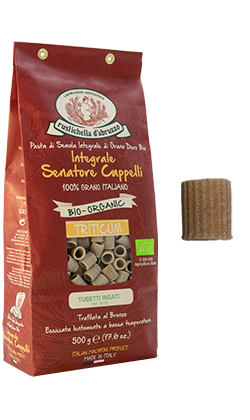 Rustichella d’Abruzzo organic ‘Senatore Cappelli’ Tubetti is particularly suited for preparing legume-based recipes, typical of Abruzzo culinary tradition. We recommend it with Rustichella PrimoGrano ‘Fagiolo Tondino del Tavo’, crispy cheek lard and our organic Extra Virgin Olive Oil. Cooking time: 8-10 minutes. Penne Rigate is very famous for its versatility, thanks to its design and for the presence of deep grooves on the surface, which allow it to collect any kind of condiment, both on the inside and the outside. 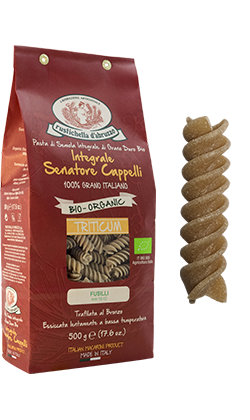 Made with certified organic ‘Senatore Cappelli’ durum wheat semolina and an artisan production process, Rustichella d’Abruzzo recommends it with all those vegetable-based sauces and a bit of our organic Extra Virgin Olive Oil. Cooking time: 8-10 minutes. 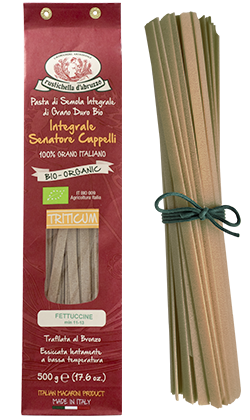 Rustichella d’Abruzzo ‘Senatore Cappelli’ whole wheat Fettuccine have the unique rusticity and the intense perfume of the ancient wheat. It is bronze drawn and slowly dried at low temperature, in order to obtain a unique texture that can collect any kind of condiment. It is extremely versatile and perfect for seafood-based condiments like shelled scampi, crunchy leek and Rustichella organic Extra Virgin Olive Oil, or with our organic ‘Pesto alla Genovese’. Cooking time: 11-13 minutes.